Photo: Gordon House, ca. 1963, 868 West Main Street, Silverton, OR. 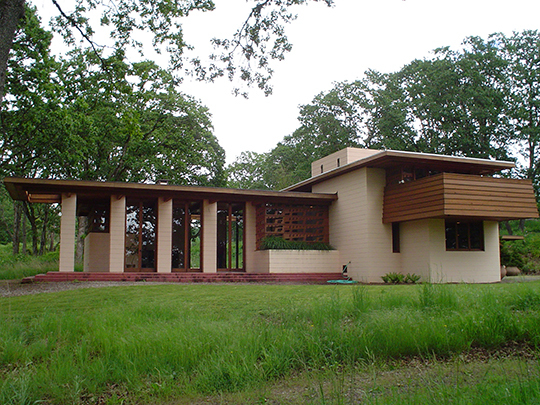 Home designed by Frank Lloyd Wright was built in Wilsonville OR; it was dismantled and moved to Silverton in 2001. Listed on the National Register of Historic Places in 2004. Photographed by User:Andrew Parodi (own work), 2007, [cc-by-3.0 (creativecommons.org/licenses/by/3.0)], via Wikimedia Commons, accessed March, 2014. The Marion County Courthouse is located at 100 High Street Northeast, Salem OR 97309; phone: 503-588-5225. Marion County, originally named Champooick District (later Champoeg), was created on July 5, 1843, by the Provisional Legislature. Champoeg District stretched southward to the California border and eastward to the Rocky Mountains. The area, however, was soon reduced with the creation of Wasco, Linn, Polk, and other counties. Marion County's present geographical boundaries, established in 1856, are the Willamette River and Butte Creek on the north, the Cascade Range on the east, the Santiam River and North Fork of the Santiam on the south, and the Willamette River on the west. The county shares borders with Clackamas, Yamhill, Polk, and Linn Counties. It contains almost 1,200 square miles. Champoeg District was redesignated a county in 1845 and renamed Marion County in 1849 after General Francis Marion, a Revolutionary War hero. That same year Salem was designated the county seat. The territorial capital was moved from Oregon City to Salem in 1852. The ensuing controversy over the location of the capital was settled in 1864 when Salem was confirmed as the state capital. Oregon State Archives, arcweb.sos.state.or.us, accessed March 2008.